Opening hours: Daily 24hrs. 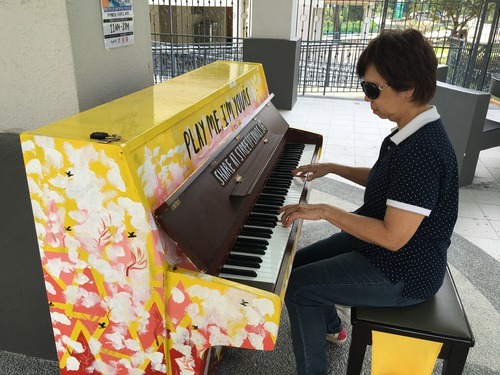 These pianos were located in the sheltered area near Rochor Canal Rd/Ophir Rd junction. 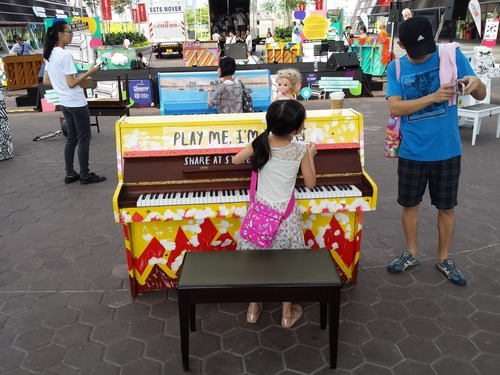 The original ‘sunny’ piano, decorated by Singapore After-Care Association (SACA) with Kate Pocklington, was replaced with two pianos; the ‘Mondrian inspired’ piano, decorated by Beyond Social Services with Simply For Love, and the ‘yellow’ piano, decorated by Sun-Dac with Isaac Liang. From the launch event on 13 March. Caption on Instagram: "30 years of marriage & the flame hasn't died for the duetting lovebirds, Mr & Mrs Yong"
From the launch event on 13 March. 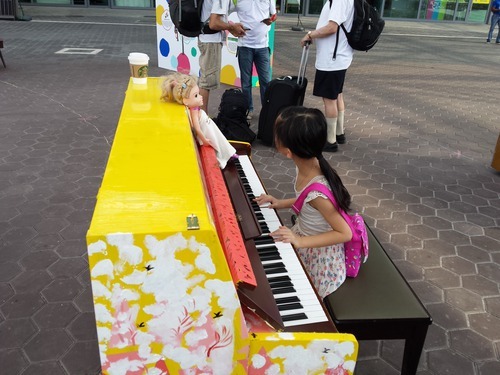 This piano is now also available to play at this location, and was decorated by SUN-DAC. This is the other replacement piano that is now in this location. It was decorated by Sun-Dac with Isaac Liang. 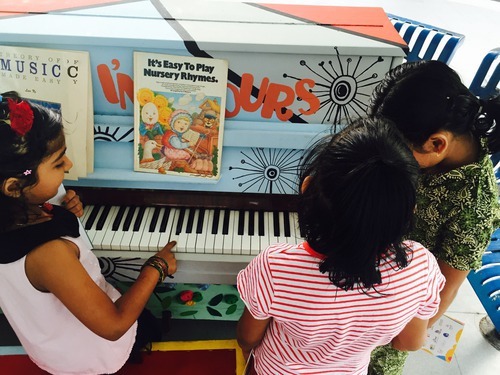 This is one of two replacement pianos now at this location. It was decorated by Beyond Social Services with Simply For Love. 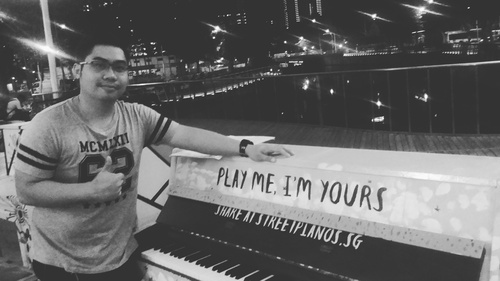 Serena, Darius and I got together to play some music in the spirit of Play Me I'm Yours Singapore on 4th April 2016 at Gateway Plaza. Serena and son Darius serenades us with their violins in Gounod’s Meditation on the 1st prelude of J.S. 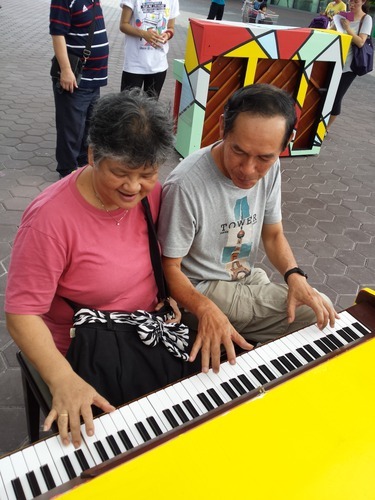 Bach (Ave Maria) at scenic Gateway Plaza. 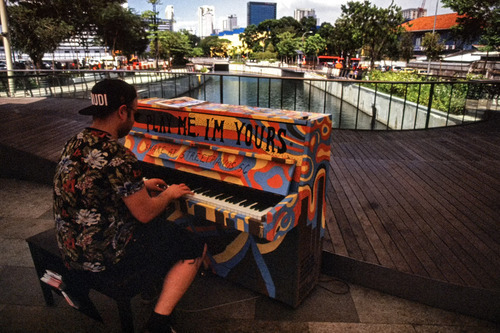 Rochor Canal (beside Sim Lim Tower) - River Flows In you.